Beautify CNMI! : How are those Flame Trees doing? Remember the 22 Flame Trees that we planted back in June? You know, the ones that helped kick off the Restoration Committee activities? Well, some of them are doing really well, while others, well, let's just say that they need to be replaced. 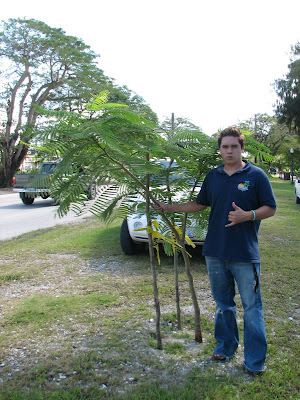 We replaced three of them during the recent Tree Care Workshop coordinated by Marianas Resource Conservation & Development Council. There are others that need to be replaced. When the rainy season gets closer, we are going to plant even more. P.S. The tree in this picture was waist high when we planted it six months ago.